Never fear, workforce analytics is here. We've put together a dedicated track at the 2018 Mega-PAW event in Las Vegas, Jun 3-7, covering Workforce analytics (retaining & optimizing HR with analytics), benefiting your work in HR analytics and beyond. Never fear, workforce analytics is here. 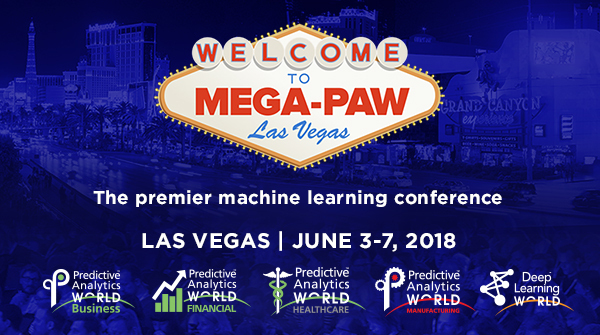 While PAW Workforce isn't running at the 2018 Mega-PAW event in Las Vegas, we've put together a dedicated track covering Workforce analytics (retaining & optimizing HR with analytics) at Predictive Analytics World for Business in Las Vegas, June 3-7, 2018. In addition to the sessions in this Workforce track, many other sessions at PAW Business are generally-applicable – so they benefit your work in HR analytics and beyond. These sessions include keynotes from the industry's hottest headliners, as well as breakout sessions on the most advanced cutting-edge methods. Check out the complete PAW Business agenda here. What systematic differences REALLY exist between what millennials actually value in employment as compared to older employees? Advances in statistical modeling have allowed us to predict and understand in depth and breadth why employees leave companies. Case Study: Atlassian, News Feeds, Notifications, Recommendations: Is Collaborative Software Actually Promoting or Hurting Employee Productivity? Learn the intriguing correlations between the usage patterns observed in workforce collaboration tools, and the productivity of the user. Statistical modelling techniques (e.g. general linear modelling, logistic regression analysis, multi-level modelling) were applied to understand the effects of, for example, Personality, Career Types, and Team Leadership on Sales Performance. Too many employees were not on billable projects so we designed and implemented a machine learning model to help us better understand even though we had only a few hundred rows of data with which to work. 4) Creating team-generated action plans. An overview of foundational laws, theories of discrimination, and approaches for measuring adverse impact and validity in the use of predictive analytics for employment purposes. What makes Predictive Analytics World the most interesting conference in the world is people like YOU. Each person you meet along your professional path is another opportunity. You will meet people who will help you, people who can show you how, and people who can help you succeed.